Scientists from the University of Southampton have developed a new technique to generate more powerful, more energy efficient and low-cost pulsed lasers. The technique, which was developed by researchers from the University’s Optoelectronics Research Centre (ORC), has potential applications in a number of fields that use pulsed lasers including telecommunications, metrology, sensing and material processing. Any application that requires optical pulses typically needs waveforms of a specific repetition rate, pulse duration, and pulse shape. It is often challenging to design and manufacture a laser with these parameters exactly as required. Even when a suitable solution exists, the size, the complexity and ease of operation of the laser are further critical considerations. 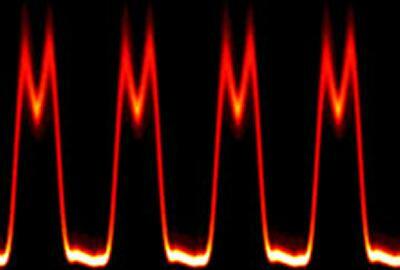 The new method works on a fundamentally different principle to existing pulsed lasers. It relies upon the coherent combination of multiple semiconductor lasers, each operating continuous-wave at different precisely defined frequencies (wavelengths). Through the precise control of the amplitude and phase of each laser’s output, it is possible to produce complex pulsed optical waveforms with a huge degree of user flexibility. The key to making the approach work is to phase-lock the semiconductor lasers to an optical frequency comb, which ensures the individual lasers have well-defined mutual coherence. David Wu, lead author of the study and winner of the 2014 Engineering and Physical Sciences Research Council (EPSRC) ICT Pioneers award for this work, said: “As our new technique is based on a different approach to that currently used, it has several distinct features that are relevant in many applications. First, it is easily scalable – by combining a larger number of input lasers, shorter or more complicated-shape pulses and/or more power can be obtained. It can also generate pulses with a very low-level of noise (down to the quantum limit) and very high (greater than one THz) repetition frequencies. The research is reported in a recent issue of the journal Optica – a new The Optical Society (OSA) journal, which focuses on rapid dissemination of high-impact results in all areas of optics and photonics (It is the first Southampton study to feature in Optica). The research is funded by the EPSRC through the Early Career Research Fellowship of Dr Slavik (EP/K003038/1) and through the “Photonic Hyperhighway” Programme Grant (EP/101196X).